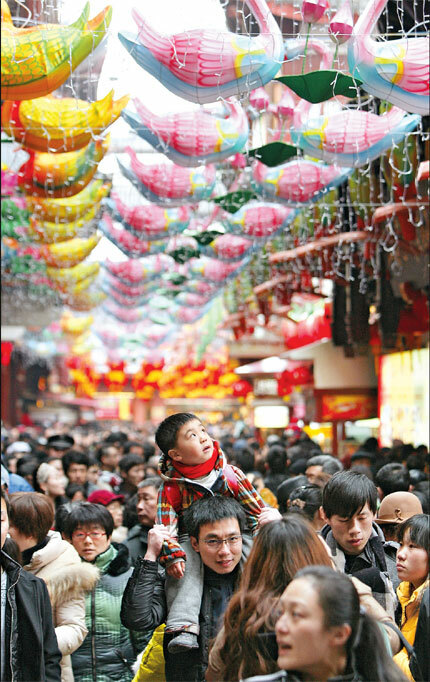 Tourists pack the Yuyuan Garden yesterday as the seven-day Spring Festival break wraps up. The city had more than 3.35 million tourists for the holiday, up 6.7 percent year on year. According to the latest data from the Ministry of Commerce, total retail sales were 14.7 percent ahead of last year, hitting 539 billion yuan ($86 billion) from last Saturday to Friday. On Monday alone, duty-free purchases in Sanya, the popular tourist destination in the southern province of Hainan, were worth 20.73 million yuan, the figures showed. Sellers on the island extended opening hours and expanded store sizes, reporting that sales of cosmetics and watches priced between 5,000 yuan and 8,000 yuan were especially brisk. "Spending during the break remained robust this year, despite the government’s recent edict curbing bureaucratic spending on luxury," said Ding Ningning, a researcher at the State Council’s Development Research Center. "Other government moves, including an emphasis on higher incomes, greater social security payments and efforts aimed at bringing migrant workers’ salaries level with others, have added to consumer confidence." Data released on Friday by the commerce department in the central province of Henan showed that retail sales there rose 17.9 percent year-on-year to 29.7 billion yuan. Jewelry sales rose 31.9 percent, boosted by Valentine’s Day promotions, but catering businesses reported only a 5.3 percent rise in business, a reflection of more frugal spending on dining. Bloomberg said in a poll of nine economists that China’s retail sales were likely to grow 15.4 percent during January and February, the fastest pace in 13 months, boosted by promotional events and the improving economic outlook. Meanwhile, some other robust numbers also suggested growing consumer confidence since the start of 2013. Data from the China National Tourism Administration released on Friday show that 76 million tourists visited 39 key tourism cities during the Spring Festival holiday, up 15 percent from a year earlier. Beijing alone pocketed 3.88 billion yuan in tourism revenue, up 15 percent year-on-year, local officials said, as 8.68 million tourists visited the capital, an increase of 7.5 percent year-on-year. Toll-free expressways during the holiday also boosted numbers from other cities by 18.3 percent against last year. The national tourism administration said 4 million Chinese traveled overseas on holiday during the break, 90 percent of them headed to Asian destinations, the most popular being Thailand, South Korea and Hong Kong. According to local travel agents, their international counterparts have been making huge efforts this year to attract more high-spending Chinese tourists, hiring interpreters, for instance, and printing bilingual brochures. South Korea had expected 630,000 Chinese tourists during the holiday, while United States officials had said that Chinese tourists now represented the fastest-growing group with numbers expected to double in the next three years. "The robust overseas shopping, mostly seen among the middle class, reflects China’s fast economic growth and opening up in the past decades," Ding added.